I am so excited to share my first ebook with you! I’ve been working on this for over a year and am thrilled with the 100+ Christmas Crafts, Activities, and recipes I’ve included. My main goal is to help families slow down and enjoy the Christmas season together. This book was created to do all the planning for you so that even the busiest families can squeeze in time to celebrate Christmas together. You will find engaging crafts, clever recipes, and fun activities for your whole family to enjoy together from ages 2-12 years old. 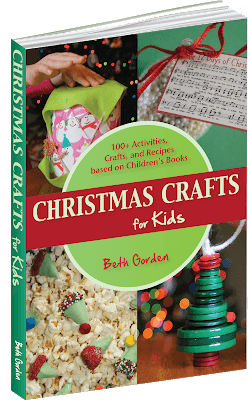 To make it simple to use, you will find the crafts, activities, and recipes are broken down into days based on a treasured Children’s Christmas book. Some of the books I’ve based our crafts and activities on are: Mr. Willowby’s Christmas Tree, The Elf on the Shelf, J is for Jesus, Rudolph the Red Nosed Reindeer, The Christmas Pirates, The Polar Express, A Present for Santa Claus, How the Grinch Stole Christmas, A Snowman Named Just Bob, and so many more. Just pick the activities that work best for your family. With over 100 crafts, activities, and recipes there is something for everyone! Also included is a craft supply list, library books list, alternate book selections, and even an alternate days activities. What are people saying about Christmas Crafts for Kids? Buy it as an ebook $9.99 sale $7.99 – The ebook will work on an electronic device such as ipad, kindle, nook, AND your home computer. Order a print version of the book – $24.99 – You can now order a professionally printed 168 page, soft cover book. I know families are busy during December! Sometimes you need the added convenience of being able to just print off something instead of gathering supplies, crafting, and cleaning up. With that in mind, I created the Christmas Crafts for Kids Add on Printable Pack! 3 Printable Countdown Calendars – These three unique countdown calendars coordinate with the Children’s book selections to help your children count down to Christmas in a fun, engaging way. 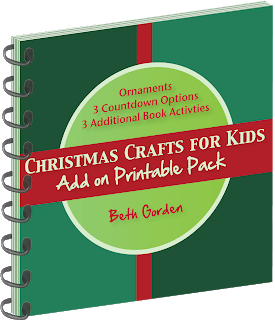 3 Additional Activities – Three new (not included in the book) activities to add the print & go convenience option to Days 5, 20, and 23.